Arthur Avenue is a street in the Belmont neighborhood of the Bronx, New York City, which serves as the center of the Bronx's "Little Italy". Although the historical and commercial center of Little Italy is Arthur Avenue itself, the area stretches across East 187th Street from Arthur Avenue to Beaumont Avenue, and is similarly lined with delis, bakeries, cafes and various Italian merchants. The Bronx's Little Italy has an Italian immigrant heritage that dates back to the 1850s. Arthur Avenue and Morris Park are viewed as the Bronx's primary Italian American communities. 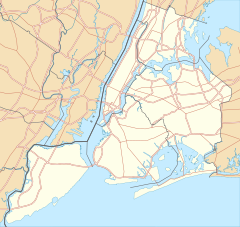 Other Italian American communities in the Bronx are the middle and upper class neighborhoods of Schuylerville and Country Club. The avenue itself is named for former U.S. president Chester A. Arthur. 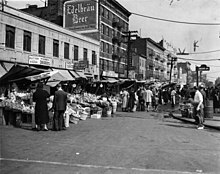 Arthur Avenue pushcarts in 1940. Robert De Niro's directing debut A Bronx Tale takes place in the vicinity of Belmont. However, it was largely filmed in Astoria, Queens. The series Third Watch was based on Arthur Avenue initially, with the first episode referring to the firehouse as "Camelot," based on its location at the intersection of King Street and Arthur Avenue. The 1973 film "The Seven-Ups" starring Roy Scheider was filmed on Arthur Avenue and Hoffman Street. In 2003, a scene from the HBO hit series The Sopranos was shot in Mario's Restaurant. Leonard of James Frey's A Million Little Pieces grew up in this area. Much of the novel Underworld takes place near Arthur Avenue. The author himself, Don DeLillo, grew up there. The opening scene of the 1955 film, Marty shows Arthur Avenue. The film's main character, Marty Piletti, works at a meat market on Arthur Avenue, and in the movie he considers buying it from its owner. Early scenes in the mid-1960s film, The Incident take place on 183rd Street and Third Avenue and in the Third Avenue El station (once the primary El station for Arthur Avenue). The scenes, featuring Martin Sheen and Tony Musante, involve the mugging of a pedestrian. The Belmont station filled in for one on the Jerome Avenue El line, which is the line that forms the film's narrative. The 1950s doo-wop music group called Dion and the Belmonts originated in this area, named after Belmont Avenue. Italian rock band Elio e le Storie Tese at the end of their song "Gargaroz" in studio album "Studentessi" featured a mock advertising of a food shop in Arthur Avenue, in Italian language with some strange Americanisms. A reality TV show called Mama's Boys of the Bronx was about grown men living on and around Arthur Avenue in the Bronx with their mothers. Lady Gaga's music video for "Eh, Eh (Nothing Else I Can Say)" takes place in and around Arthur Avenue/Little Italy. In 2016, Arthur Avenue was named one of "America's Greatest Streets" by the American Planning Association. Belmont, Bronx - The Bronx neighborhood encompassing Arthur Avenue. Google (July 3, 2018). "Arthur Avenue" (Map). Google Maps. Google. Retrieved July 3, 2018. ^ Mariani, John (June 5, 2016). "The Real Little Italy and Best Restaurants Are in the Bronx". Retrieved June 8, 2017. ^ Associated Press (September 11, 2011). "Is NYC's Arthur Avenue the Real Little Italy?". Fox News. Retrieved June 8, 2017. ^ Crowley, Chris. "A GUIDE TO ARTHUR AVE, NYC'S BETTER LITTLE ITALY". Thrillist.org. Retrieved June 8, 2017. ^ Donovan, Aaron. "If You're Thinking of Living In/Belmont; Close-Knit Bronx Area With Italian Aura", The New York Times, July 29, 2001. Accessed October 11, 2007. "When the city began to build streets in the area in the late 19th century, Catherine Lorillard, an admirer of the 21st president, Chester A. Arthur, asked that the main street in the area be named after him, Mr. Ultan said." ^ Passaro, Vince (May 19, 1991). "Dangerous Don DeLillo". The New York Times. New York: NYTC. ISSN 0362-4331. Retrieved May 6, 2015. ^ Chronopoulos, Themis. ""Paddy Chayefsky's 'Marty' and Its Significance to the Social History of Arthur Avenue, The Bronx, in the 1950s." The Bronx County Historical Society Journal XLIV (Spring/Fall 2007): 50-59". Archived from the original on January 20, 2013. Retrieved June 6, 2012. ^ "Arthur Avenue selected as one of 'America's Greatest Streets'". The Bronx Times. October 8, 2016. Wikimedia Commons has media related to Arthur Avenue. This page was last edited on 4 December 2018, at 18:13 (UTC).